Up to 150,000 migrants have come from Ukraine to Belarus since the beginning of the military conflict in Ukraine. The figure was presented by the president of Belarus Aliaksandr Lukashenka during his recent meeting with a Ukrainian politician Viktor Medvedchuk. According to the president of Belarus, all migrants from Ukraine were granted equal conditions and rights with Belarusian citizens. It is very complicated to find migrants from Ukraine in Vitsiebsk region, since recently. Quite a few of them returned to their native land on receiving the first salaries at the agricultural enterprises they worked for. These enterprises were responsible for providing the migrants with work places and accommodation. Other migrants moved to other Belarusian regions, and only few families have remained in Vitsiebsk area. 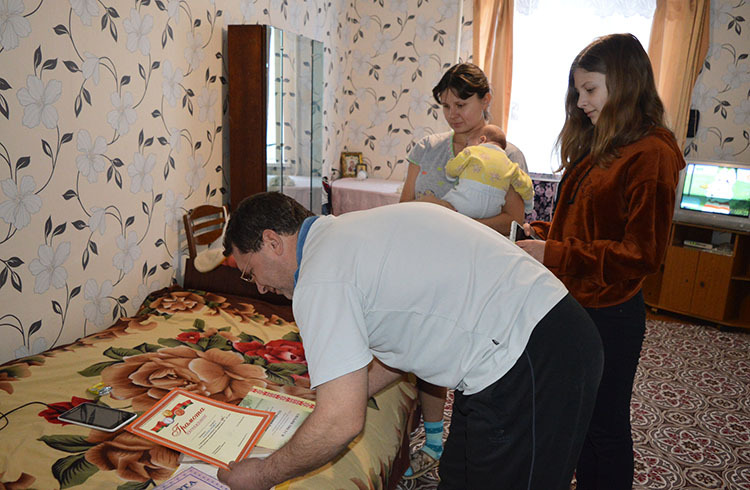 The Sheldunovs are one of such families, who moved the the poorest Sharkaushchyna district of Belarus from Makeyevka in Donetsk region of Ukraine in 2014. “WE JUST BOUGHT AN APARTMENT, MADE REPAIR – AND HAD TO MOVE OUT”. The Sheldunovs couldn’t imagine that they would have to leave their native city of Makeyevka on just buying a new apartment. They had dreamt about it for so many years. However, as soon as everything appeared to be settled, the military conflict started in Ukraine. Ilya used to work as a serviceman on air-conditioning and Sviatlana used to work as an economist in a Ltd. company before the war. As the Sheldunovs say, they didn’t decide to leave at once, since they didn’t want to leave their home city and their cosy apartment. They had lived and suffered from everything happening there until August 2014. It was only then, when the bombings started in the city and they could hear the burst bombs that they made up their minds to flee their native place. “My mother-in-law said, ‘Take the money, go to the sea-side, and relax there.’ And I told her back: ‘What sea, Mom, if bombs fall on our heads?’ – recollects Illya Sheldunov. According to the Sheldunovs, their first thoughts after the bombings were to flee the city as soon as possible, in order to save and their children’s and their own lives. Their elder daughter Alena went to the second form at school at that moment of time. And their junior son Aliaksey was only 1 year old. ‘We left for nowehere. We didn’t have any friends or relations in Belarus’, Sviatlana Sheldunova said. ‘Our neighbor’s sister resides in Belarus, and the neighbor advised us to move to this country. She said that it would be fine there. And we decided to go together with her’, she added. ‘We went together to Minsk only’, Sviatlana’s husband Ilya said. ‘Then our neighbor went to her sister in Homiel region, and we remained in Minsk, in order to visit the migration service and learn all details, concerning the forced migrants from Ukraine. I remember the day, when we arrived. It was raining. It was cold. And I was standing there in shorts and flip-flops, holding the cradle’, he added. The family rented an apartment in Minsk at the beginning. However, they had enough money for three days only. Sviatlna noted that the apartment owner was a kind-hearted person and let them stay in the apartments for the 4th day free of charge. The Sheldunovs went to the migration service on their arrival in the capital of Belarus. Sviatlana notes that they were told from the very start that, most probably, they wouldn’t be granted the refugee status. Also, they were advised by the migration officers to look for employment with the provided accommodation on their own, in order to get the residence permit afterwards. ‘We didn’t know the notion of the ‘refugee status’ at the beginning. The migration officers explained its meaning to us. Also, they warned us that although we could apply for the status in Belarus, it would be very hard to get it. They told us that few people had received the ‘refugee status’ in the previous years. Therefore, they advised us to look for employment instead. 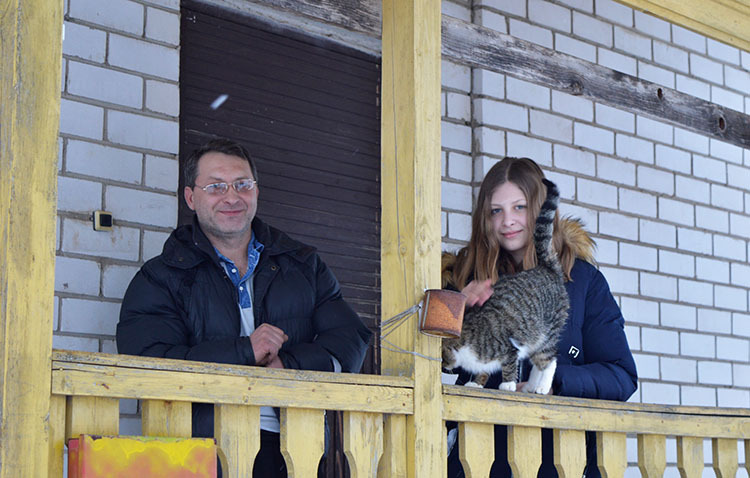 They told us that we could stay only for three months as guests in the country and recommended us to find some job with the provided accommodation within the period of time, if we wanted to stay in Belarus. We followed their advice’, Ilya said. The Sheldunovs started looking for vacancies on the Web-site of the Ministry of Labour of Belarus – www.mintrud.gov.by, which was recommended to them by the migration service. Sviatlana said that they had tried to look into all job proposals and get in touch with all potential employers, whose adverts were posted on the Web-resourece. 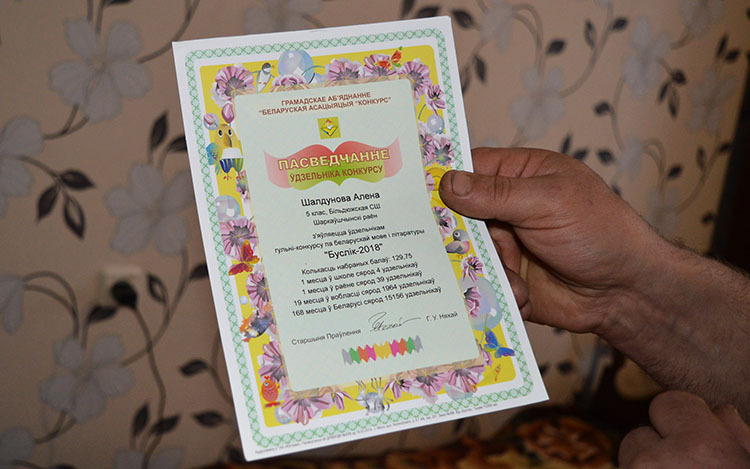 The ‘Zhviranka’ agricultural enterprise was the first place they managed to reach by phone. It is located in the village of Bildziuhi in Sharkaushchyna district. Siarhei Chaprouski was its Director then. He told them to come and promised to provide them with employment and accommodation. ‘We didn’t know at that time that we were going to the poorest district in Belarus. We were told that a nice resort town of Braslau is located nearby. We got interested in it. However, we experienced a light shock on coming here’, Sviatlana confessed. The Sheldunovs added that the migration officers warned them: ‘As long as you work at the collective farm, you live peacefully in Belarus. As soon as you resign, you will have no more grounds to stay in the country any longer’. Moreover, they warned them that Belarus is a legal state. Therefore three violations of the law, including even a fine for the absense of a flicker, may lead to their deportation from the country. Ilya works as an engineer on the laborious processes at ‘Zhviranka’ agricultural entreprise nowadays. According to him, he never heard before about the existence of such a specialization as ‘laborious processes’, which are described by the Belarusians in just two words. However, he had to learn everything and even work for several people at a time. In addition to this, he had to learn to get a tractor driver’s license and become a welder. The collective farm lacks hands, as Ilya said. However, if he loses this work even for a couple of warnings, his family will lose the accommodation. Then, it will be needed to look for the problem solution, in order to avoid deportation from the country. Sviatlana wanted to find a job in her economist trade and tried to get employed at the farm office, where the farm management works, first of all. However, she was told that none of vacancies were available there, and that even they had to make some of their employees redundant. Consequently, she worked at the farm canteen for one season. Then, she had to study to become a laboratory assistant. Presently, Sviatlana is on maternity leave. The family’s living standard dropped in comparison with their Ukrainian experience, indeed. In particular, the Sheldunovs confessed that they had enough money for food only. However, they emphasized that Belarusian are very sympathetic and kind people. The locals helped the migrants’ family in any possible way on their arrival. The Sheldunovs came to Bildziugi with three bags only. They were accommodated in a house without any furniture in it. The locals provided the family with all the required furniture. It was mostly old, but it was helpful to have it. Also, the villagers helped the forced migrants with products and money at the beginning. Some volunteers from Minsk came to them. They brought a lot of clothing, products, and an electric kettle pot. Sviatlana had got acquainted with them in the Internet and told them about their trouble. Being in complete despair, she found a social media group that supported refugees and migrants and she got in touch with them. Sviatlana reiterated that she experienced a light shock and cried a lot at the beginning. She didn’t know how to start their life anew in the village from zero on arrival from a big city with thousands of dwellers. She told that she had lived in a private apartment without a backyard garden before. Also, she told that she had seen a cow on pictures only. ‘Therefore, she wanted to make the first selfie in Bildziugi at a farm with cows’, Ilya added with a smile. The Sheldunovs noted that thirty percent from Ilya’s salary were directed by the employer to the local supermarket, where it was necessary to select the required foodstaff, and that he rest of the money was paid in cash. Ilya’s salary at ‘Zhviranka’ agricultural enterprise totaled from 300 to a bit over 500 Belarusian rubles, depending on the season and the amount of work performed. The Sheldunovs claimed they didn’t have any side jobs here unlike in Ukraine. Therefore, they had to earn for a living from their salaries only. Also, they noted that like all Belarusians, they were waiting for the salaries which would equal 500 USD, promised by the head of state of Belarus. The family doesn’t have any domestic animals apart from thirteen hens. They grow only a few of vegetables to have enough products for cooking borsch. The non-normalized work at the collective farm exhausts Ilya. Consequently, he practically doesn’t have any physical strength for subsidiary farming. The elder Sheldunovs came to Belarus with their passports. However, the children were let in the country with their birth certificates. The migration service officers ask them to get passports for their children now. They are told either to go back to Ukraine to have the passports issued or to make the corresponding arrangements through the Embassy of Ukraine in Belarus. The children, Aliaksei, 5 y.o. and Alena, 12 y.o. have got accustomed to Belarus. They have found new friends here. The youngest child, Mikhail is 2 months old. The baby was born in Belarus. Although being themselves creative people, the Sheldunovs are very proud of their children. Their daughter Alena studies at the 6th form. 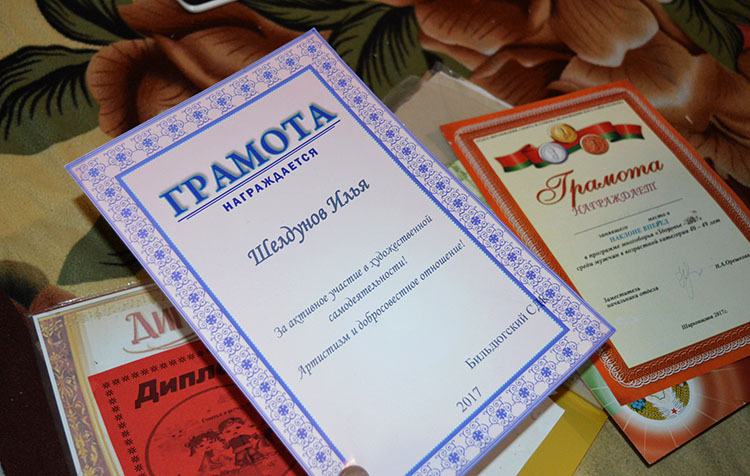 She got the first position in the district school competition and the ‘Buslik’ national contest in the Belarusian language a year ago. According to the parents, their daughter speaks Belarusian fluently, and knows the language even better than Ukrainian. Alena regards the Belarusan language classes as her most favourite subject at school. Ilya Sheldunov explains the reason for the beginning of military actions in Ukraine like this. The Sheldunovs don’t know for sure, whom to blame for them. In their opinion, this conflict might have been stirred up because of the adoption of the Law of Ukraine ‘On Languages’. The forced migrants also believed that Russian would be banned and that they would have to speak Ukrainian only. And they had spent all their life in the area of Ukraine, where the majority of people spoke Russian. ‘We don’t know ourselves, what this war is about. It is different from the times of the Great Patriotic War, when it was possible to see Germans here and Russians there. If they reach an agreement, they don’t shooot. If they fail to reach the agreement, they shoot. Nobody knows where those bombs fly from. Some people blame Russians for the attacks. Other people put the blame on Ukrainians. Everyone is mobile now. Here they come, install their mortars, shoot, and depart, leaving the local people in grief…’, Ilya said. 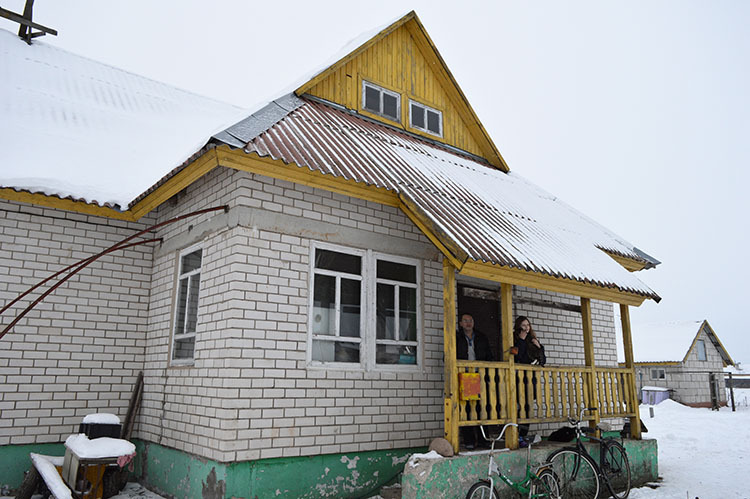 All Ukrainian families, who used to live in Bildziugi and used to work at the local agricultural enterprise, have left the settlement. The Sheldunovs are the only family remaining in the village. According to them, the youngest son Michail has to grow up a little bit. Therefore, they plan to stay and work a bit longer here in Belarus. However, they are longing for their motherland, like all the people, who live far from their native places. They communicate with their relatives by skype nearly every day. Their relatives advise them to come back. The Sheldunovs used to cherish a thought about coming back home. However, since Sviatlana visited her motherland two years ago and was nearly shot on the way to hospital, all thoughts about the return to the native town dissapeared. Makeyeuka was bombed non-stop for three nights and days at that time. Sviatlana was seating in outerwear and praying with an icon in her hands in the corridor of her parents’ apartment. And her farther was calmly commenting on the directions of bombing. He was trying to soothe his daughter this way. Sviatlana understood after the visit that she would get back home with her family only in case of the declared ceasefire. However, the Sheldunovs confessed that they didn’t belive in the ending of the military actions in their native Makeyeuka in the near future.